Video 1 includes Oslo, York, Mammen, and Finnish Stitch. Video 2 includes Dalby Stitch, and Russian Stitch. There are many ways to write down and describe nalbinding stitches: Margarethe Hald's (1950), Toini-Inkeri Kaukonen's (1960), Odd Nordland's (1961), and Egon Hansen's (1987), the latter of which Larry Schmitt has improved with a few additions, as well as Sigrid Briansdottir has also done. Also Bernhard Dankbar (2012) has recently developed an improved way of describing stitches. Danish Egon Hansen published his nalbinding notation system in: Textiles in Northern Archaeology - NESAT III in Textile Symposium in York “Nålebinding definition and description” by Egon Hansen, 6-9 May, 1987. The article itself is only 7 pages long, and if you are interested in it, you might have an access to it via an inter library loan. Hansen's Notation is one of many, it is widespread, useful with most stitches, and also not that difficult to understand once you get the idea. Hansen's Notation is not perfect, and describing for instance Åsle Stitch, Dalarna Stitch, or Omani Stitch is quite akward, but with most other stitches it works fine. It tells the connection stitch rather well, in most cases anyway, how to insert the needle before the turn, after the turn, and how to manipulate the thumb loop(s) and the needle yarn. Kaukonen's system, for instance "2+2+2", is at least for me an easy one to remember, easier than Hansen's UUOOUU/OOUUOOO, and it may help to see some logic between stitch types (1+1, 1+2, 1+3, etc), but Kaukonen's system does not thell what happens at the end of the stitch, e.g. 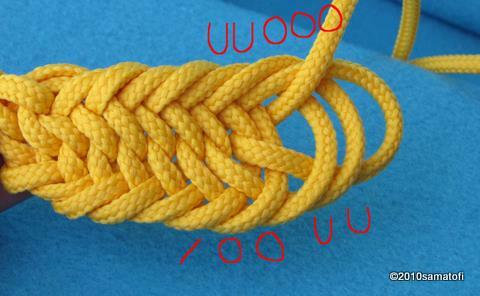 if there is a "plaited edge" or not, UUOOUU/OOUUOOU. Nordland's system may be confusing but it has its logic. Kaukonen's 2+2+2, or Hansen's UUOOUU/OOUUOOO would be in Nordland's system 8(223) if the connection stitch is F1, but 8(222) if the connection stitch is F2. 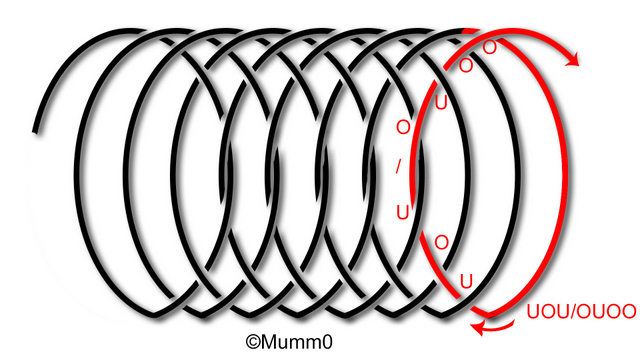 A greater problem with Nordland's system is that one code can mean several different stitches, for example 3(1) in Nordland's system may stand for O/UU F2, O/UO F2, U/OO F2, or U/OU F2 in Hansen's Notation, or, another example, 5(111) may stand for UOU/OUOU F2, or UOU/OUOO F2. Neither does Nordland's system tell whether the connection stitch is F1, B1, M1, or something else. The red yarn shows one full stitch (pictured how Nordland marks it). The numbers I to V mean "intersections" 1 to 5, so this is "a 5 system" stitch. The numbers 1-1-2 mean how the yarn goes 1 x over, 1 x under, and 2 x over, thus "112"
For instance Rådmansö Stitch and Kizhi are impossible to describe by Kaukonen and Nordland’s systems, because they are not fully symmetrical on both sides of the ” / ” (turning of the needle). Hald classified stiches with Roman numbers I, II, III, IV - which don't really tell much about how the stitch is done. Dankbar's Nadelbindeschrift is different. 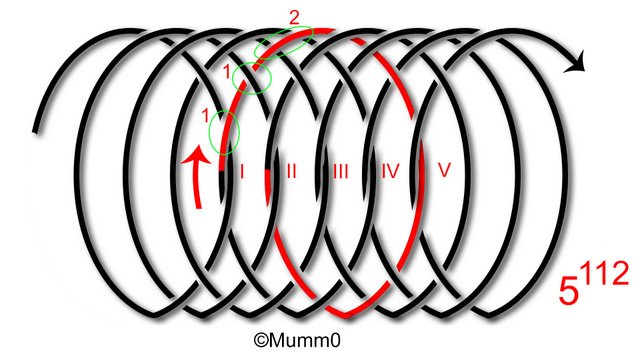 It is based on the nalbinding action itself, how to do the stitch, and it uses numbers to mark the loops, and arrows to show which direction to point the needle to. At the moment it is available in German only (link). Hansen's Notation is not necessary information to know when you are nalbinding or learning to. Knowing Hansen's Notation, however, makes it possible to understand and learn new stitches only by reading the Notation. There are also marks : and ( ) , but they are used seldom (e.g. Åsle Stitch). Note that the U's and O's are read when you take your work off your thumb, and lay the work flat in front of you. You read the Notation from left to right, as you'd read text, but in your work you read the U's and O's starting from the right bottom corner, and going clockwise in a circle. When your work is still around your thumb, you can simplify things, and imagine U means the loop(s) around your thumb, O means the loop(s) you pick up onto your needle behind the thumb.